Sam’s French toast, originally uploaded by Tiger_Bee. Sam’s French toast is the stuff of dreams. It’s basically the perfect diner breakfast. I know that by saying this, I’m risking losing some of my local food cred. But Sam’s French toast is amazing. And there’s no replacement. 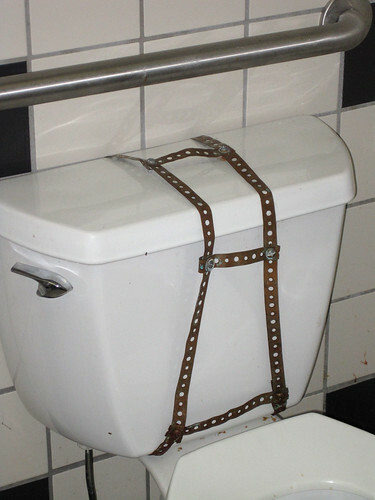 You’d think that some other diner would be able to figure this stuff out. I mean, take a couple of slices of white bread – the more commercial and generic, the better. 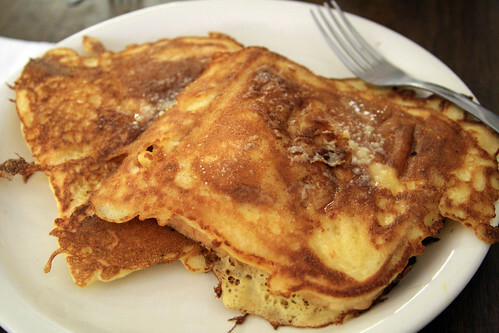 Dip them in pancake batter – probably batter made from a box mix that can be bought in bulk at GFS. Slap it on the griddle until it’s toasted golden, then top with cinnamon sugar and a small lake of imitation maple syrup. You wouldn’t think it’d be that hard to duplicate. You probably also wouldn’t think it’d be so damned good that this weekend I tried to write a song about it to the tune of Julia. But seriously, guys, this is the best French toast on the planet. Oh Champaign, I have missed you. And you apparently have missed me, as within five minutes of parking our car, I saw someone I knew from my Aroma days. We were in town for Darren and Hannah’s wedding – Shane’s first trip back since we moved in 2007 – and kicked off our trip with a visit to the Esquire. $5 for a pitcher of PBR! It’s not good beer, but it is exceptionally cheap beer, and we split it while catching up with people at Symposium. Some things never change – if it’s a warm summer night, GSLIS folks will be found on a patio, and DocD will be alternating between coffee and white wine. With our alcohol blankets firmly in place, we wandered over to the Piglet, the new Blind Pig brewery. 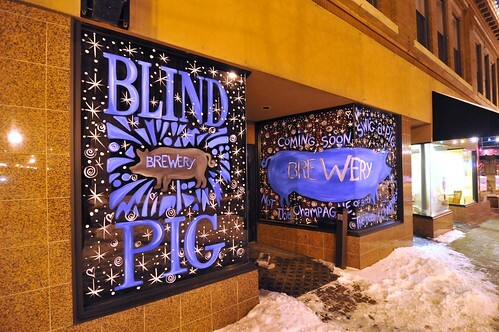 The original Blind Pig was voted one of the top 50 places to drink beer in the country, so we had high hopes. I really enjoyed my cider, while Shane was less satisfied with his APA – good, but nothing to write home about. The new space is great, though, and if we were still in town, I could see us hanging out there all the time. We’re on the cusp of summer right now, halfway between the austerity of winter vegetables and the abundance right around the corner. Around this time of year, my thinking about food gets all muddled up. In the colder months, we fall into a routine of planning meals, then going to the grocery store with our carefully composed list. There are almost always impulse buys, but we come home with the fixings for a week’s worth of meals and maybe a little extra to throw in the freezer. Come summer, though, our crisper overflows with whatever’s available at the market – which isn’t to say that we don’t plan in advance, but we’re definitely more prone to improvisation. Over the last couple of years, frittatas have become key to getting through excess market produce. If we participated in a CSA, I can only imagine that our frittata consumption would be exponentially higher. Tonight’s frittata was made with the mysterious spinach-like greens from our garden and enriched with a handful of shredded cheddar cheese. Many of the recipes you’ll find online call for 5-8 eggs, but I’ve found that 4-5 are plenty for the two of us for a quick dinner. If we’re entertaining or want to have leftovers for lunch, I’ll use more eggs and veg, and will serve with bread and/or a salad. Preheat the broiler. Melt the butter in your pan, swirling around to coat the bottom and sides. Sautee your veg until tender, then pour the whisked eggs over the top. When the eggs are just set, top with your cheese, then transfer to the broiler and broil until golden. Serve from the pan or, if you’re fancy and careful, flip out onto a plate and serve at the table. I went running after work yesterday on already sore knees, and within half a mile, I had to stop. The hills hurt too much. I walked until I found a relatively flat route, and then put in almost two miles before I had to quit altogether. I walked the rest of the distance home, arriving drenched in sweat and on the verge of angry sobs. I hate feeling out of control. I hate that I might not be able to do my first 10K in two weeks. I hate that I have to admit that something might actually be wrong with my knees. I turned the fan on full bore and stood in front of it in my sports bra, feeling terribly sorry for myself. I want my life to be full of the sort of grace that comes from aggressively taking my worried attention off myself, and turning my mind toward others. Waves of every single emotion at once. Waiting by the phone. Obsessively reloading her Facebook profile in hopes of news, and now in hopes of photos of the little guy that we don’t get to meet for another few weeks. Happiness. Jealousy, not because I don’t have a baby of my own, but because her family now includes a perfect little boy, because she has experienced things I haven’t experienced and can’t understand. Sadness that we don’t live closer, that I won’t be able to be a more regular part of his life. Wondering what my role will be in his life. Relief and thankfulness that everyone came through (and out) OK. Getting choked up at the DMV watching mothers accompanying teen sons who are getting their permits. Getting choked up at pictures of my dad holding my nephew, so similar to pictures of my dad holding me – the joy on his reserved face. Realizing that I am the same age now as my beloved aunt was when I was born, and hoping that I can be as special and wonderful to my nephew as she has been to me. Wishing I could do more to help. Love. So much love. Despite all of the anticipation and backlash about the LOST finale, I woke up feeling just fine about it. There were a lot of questions that weren’t answered that drove me crazy last night. There were dropped threads, missed connections, and continuity problems out the wazoo. The ending was unsatisfying and more than a little too convenient. But maybe in the end that’s what it was all about? That the best we can hope for is peace and happiness, that our lives mattered, and that we will be reunited with those that we loved and lost? And the worst we can imagine is the absence of those things, isolation, fearful monsters, and a constant battle against real and imaginary adversaries? I don’t know that the ending could’ve been any better or worse than it actually was. And maybe that makes us all suckers for wanting to believe? What I’m mostly thinking about right now, though, is our shared desire to make sense of things by telling stories. And I kind of love that this will be LOST’s legacy for me. I still don’t know how much credence I give to these things, but the last two Astrology Newsletters have really resonated with me and where I am right now – emphasis below is mine. CAPRICORN (Dec. 22-Jan. 19): “Is Fast Food Too Tempting?” read a headline in *The Week* magazine. The accompanying article discussed whether people have the right to blame and even sue McDonald’s and Burger King for their health problems. In my opinion, we might as well add other allegedly appealing poisons to the discussion. “Is heroin too tempting?” “Is cheating on your lover or spouse too tempting?” “Is watching TV five hours a day too tempting?” I hope you’re seeing where I’m going with this, Capricorn. The coming weeks will be a good time to take personal responsibility for any supposedly fun activity you’re doing that warps your character or saps your energy. It’s prime time to end your relationship with stuff that’s bad for you.